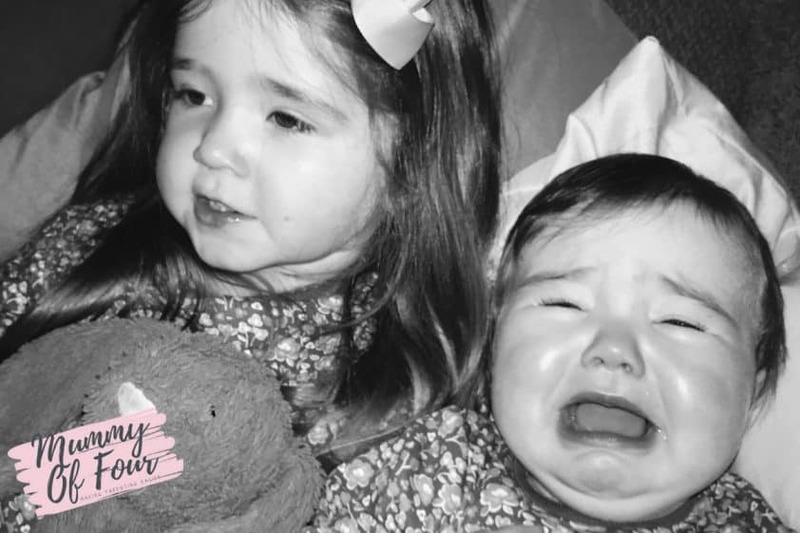 It is never nice when your children are ill. Not only is it so hard to watch your little baby feel poorly and suffer, it can also cause a tremendous amount of stress and sleep deprivation for the parents. Luckily there are a number of things that you can have in stock to ensure that you are prepared just in case a family member becomes ill. 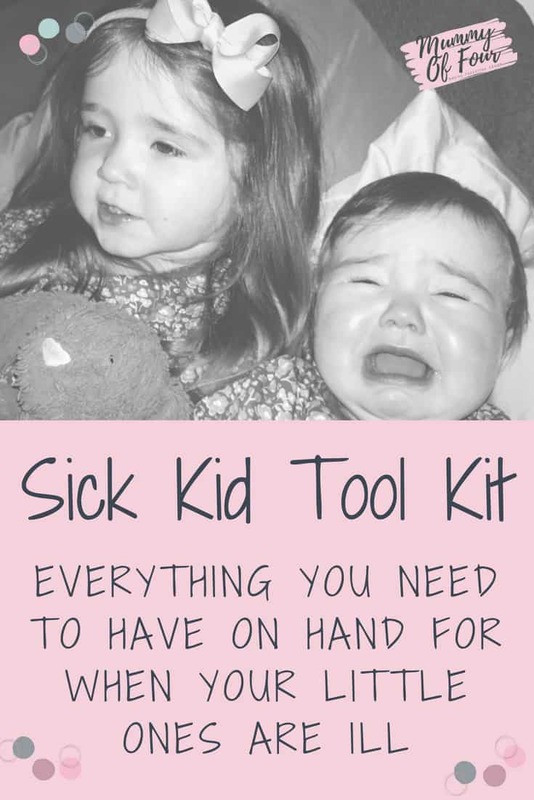 This little tool kit of things will make caring for your unwell offspring much easier. It is a really good idea to keep a record of your children’s medication in a central location where everyone who is caring for your little one can see it and stay up-to-date. 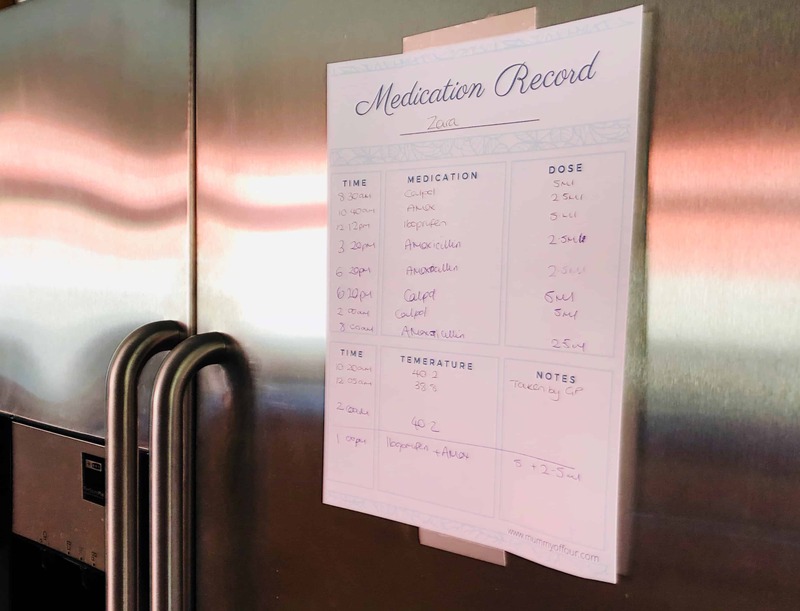 An easy way to do this is to stick the medication chart somewhere visible, such as on the fridge. You can download my free chart that you can use to record your child medication doses and temperatures by entering your details below and joining my parenting email club. When you are speaking with or visiting your doctor, either take a photograph of this chart on your phone or simply rip it off the fridge and take it with you. When your child last had medication and how their temperature has been fluctuating is relevant information when diagnosing what is wrong with your child. I’d recommend printing off some of these charts in advance that way you will have them to hand to grab for if and when your child is unwell. 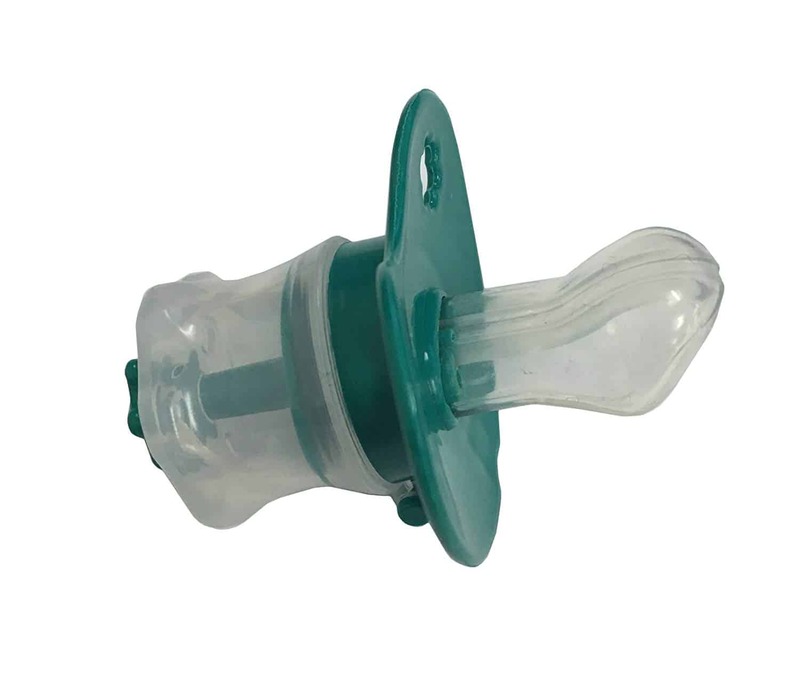 In addition to recording medication on a chart, it can often be a good idea to record certain doses of medication directly on the bottle as shown in the picture below. This can be especially handy when your child needs a specific number of doses of medication when taking something such as a course of antibiotics. Either use a sticky label as shown here or a marker pen to write straight onto the bottle. Keeping spare bedding in your child’s bedroom, rather than in another area of the house such as airing cupboard, is always a good idea. Providing you have space, having bedding to hand makes life so much easier when you’re cleaning up vomit in the middle of the night. Doing this means you will be far less likely to wake the rest of the house and makes the whole process much quicker. I keep a complete spare duvet with a clean duvet cover on it in each of my children’s bedrooms at all times. It makes beds changing quick and easy at any time of the day and night. As soon as the clean bedding comes out of the wash, they go straight back onto the spare duvet. 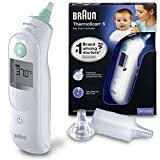 Every family needs a thermometer. 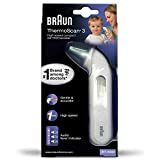 I was using a forehead scanning thermometer for a while. While the children thought it was cool (it was a bit like those guns that the police used to catch speeding cars), I found that it was not terribly accurate. 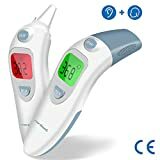 We have now gone back to the in-ear thermometer which works much more consistently. Don’t forget to record your child’s temperature each time you take it with the thermometer on the chart you can download at the bottom of this post. This tip may sound a bit new age or strange but bear with me. 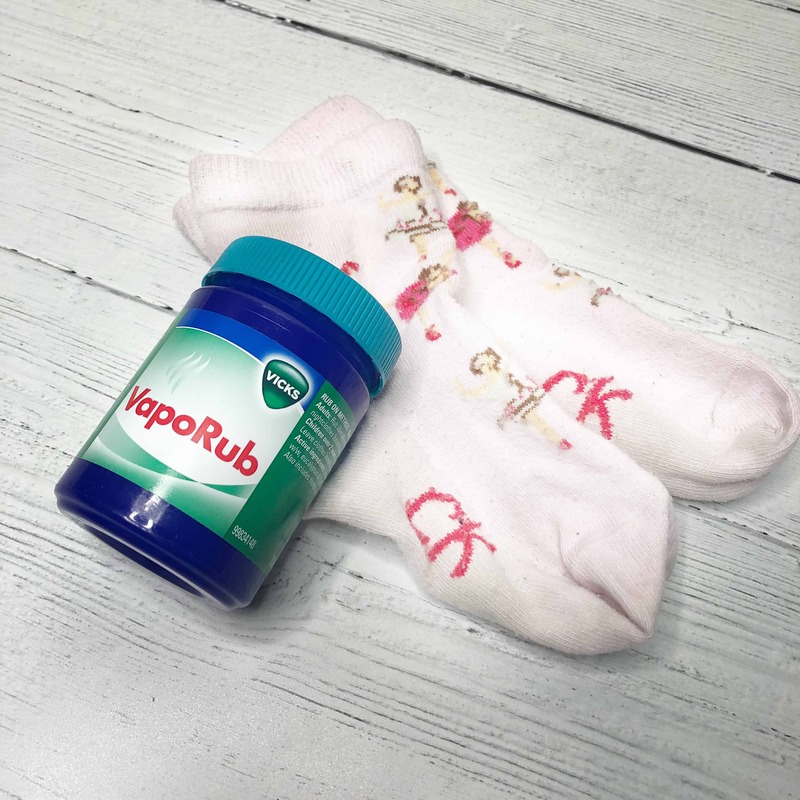 For some reason, if you put vapour rub on the soles of the feet of the person suffering with a cough, then cover those feet with socks, it eases and coughing. The person who was previously coughing will then be able to sleep. I don’t understand the science behind it, I just know it works. When I discussed it with my GP, he said that he didn’t know exactly why it works either, but that he does this with his own children too. It goes without saying that you must always get seek medical advice if any member of your family is unwell with a cough or anything else. Plus, only use the vapour rub that is suitable for your child’s age (see directions on any packaging). Still, if you have seen a doctor and been sent home to care for your poorly child who has a cough, give this a try. Towels can be your best friend when your child is ill, especially when there is a vomit situation. By covering your toddler’s bed with towels and even using towels as a blanket while you cuddle them, have towels are on hand at all times to hopefully catch the worst of any surprise sick. This will hopefully minimise the amount of washing that you have to do for larger items such as duvets, mattresses and sofa cushions. Whether your child is ill at the moment or not you should always, always have an in date bottle of both Calpol and Iboprufen in stock. I guarantee you that if you do not, then your child will suddenly become ill and urgently require it. Chances are it will probably be a weekend or late at night when nothing is open. Go and check you have some in stock. Seriously, do it right now. Another tip is to keep and store every syringe that comes with a bottle of Calpol or Nurofen for Children, you’ll be grateful for all those extras when you’re in the thick of flu season. 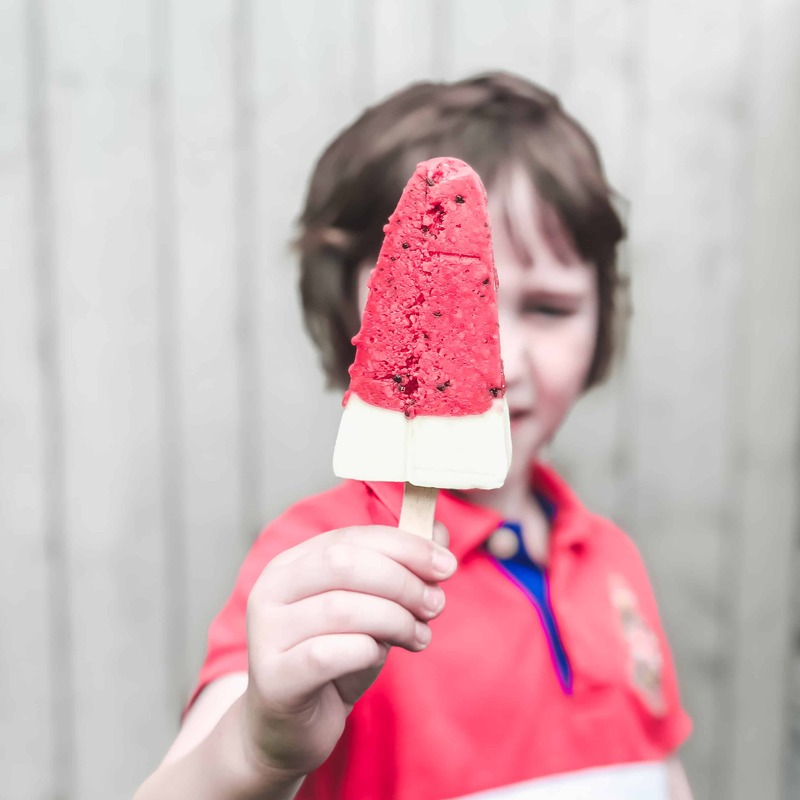 If your child is old enough to eat ice lolly, it can be a welcome way to help to bring down their temperature, distract them and potentially soothe sore throat. Obviously, this does not replace things such as medication to control fevers, that it is a good weapon to have in your arsenal. Did you know that marshmallows were family medical kit essentials? A bag of frozen marshmallows is often a better alternative to a bag of frozen peas to soothe bumps. They also have medicinal properties when it comes to soothing sore throats (again, not sure of the science behind why I just know that it works). That and they are yummy. Spare clothes are a must when your little one is ill. Especially if there is vomit involved, you will end up be going through a lot more clothing than you normally would. It is often a good idea to simply keep them in pyjamas so ensure that you have plenty of PJ’s in your child’s current size. This will mean they are easy to change and wash and won’t require ironing during the illness period while you washing quadruples. Those are my recommendations for the things that every household should have in stock for when their children are ill. Which are essentials do you reach for when your child is ill? Let me know in the comments below. Disclaimer & Disclosure – Please always seek medical attention from a healthcare professional if you are worried about any member of your family. I am not a doctor, just a Mum sharing what I find works for my family. This post also contains affiliate links, meaning that if you click through and make a purchase, I will make a small commission.